The founder of the Kiyan Prince Foundation, Dr Mark Prince, has been awarded an OBE in the New Year’s Honours list. Dr Prince’s son, Kiyan, a youth player for Queen’s Park Rangers, died after being stabbed in 2006. 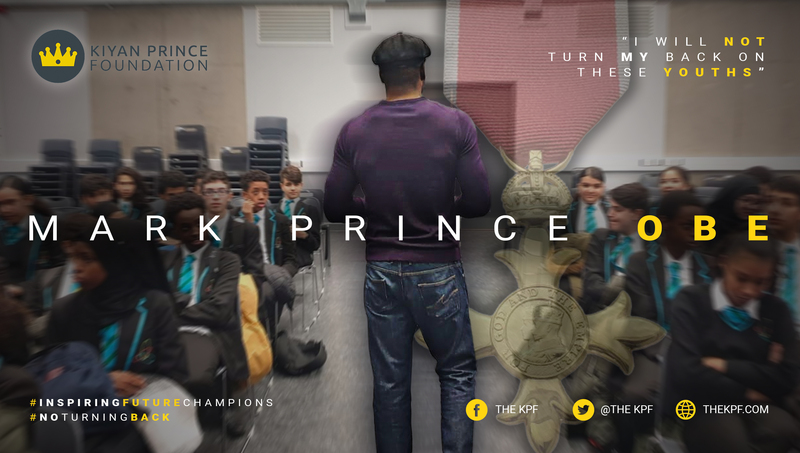 Founding the charity the Kiyan Prince Foundation shortly afterwards, Dr Prince has since worked tirelessly to educate young people about the consequences of knife crime and steer the most vulnerable young people away from such destructive behaviours. KPF offers school talks and one-to-one mentoring designed to steer young people towards success, positivity and peace. “While I am honoured to receive this OBE, how horrific that it has come to this at all: That I should have to work so hard to prevent the murder of our nation’s youth. There’s been a lot of talk from the authorities on tackling knife crime, followed by a lot of heel-dragging paying for and implementing the solutions that have been proven to work. How can anyone put such a low price on young lives? It should not take record numbers of people killed to make this a priority. It should not take a campaign group to keep this issue in the public eye. There is robust evidence that interventions work – something the Kiyan Prince foundation has been pushing for since 2007, and which is only now being attempted 10 years and over two thousand knife murders later. Mark Prince is a former boxer, an ex-International IBF and WBO Champion. Kiyan prince died after intervening to stop a fight outside his school. A 16 year old boy was convicted of Kiyan’s murder in 2007. KPF uses the hashtag #inspiringfuturechampions to highlight some of its work. UK knife crime continues to rise, particularly in London. The most recent set of figures, from the Office for National Statistics – covering the first six months of 2018 as well as the final half of 2017 – show that, nationwide, police recorded 39,332 offences involving a knife or sharp instrument, a 12% rise year-on-year, and the highest number since 2011 (data from the Greater Manchester service were excluded from those figures because they aren’t directly comparable). For more information, or to arrange to speak to Mark Prince, contact Chris Magee on 07771 615072.